Once you make the decision to go to school, the next biggest issue is how to pay for school. Cash on hand? Not usually something most students are able to rely on, so this leads you to the next step: how to find financial aid. You can usually obtain financial aid in the form of student loans, grants, or scholarships. Unfortunately, higher education is expensive and you have to find out how to pay for school before you can enroll. Consider these available online financial aid sites and options. One of your first steps after choosing a school to attend, or possibly even before, is to fill out what is known as the FAFSA, which stands for Free Application for Federal Student Aid. Most students qualify for these low interest federal student loans, with no credit check necessary. Repayment terms typically require you to begin regular monthly payments six months after graduation. To fill out your FAFSA online, you will need financial records, such as your last income tax return. You will also need the school’s identification number, which your school should supply for you. If not, you can use the search function on the FAFSA site to find your school’s number. Plan on about an hour to an hour and quarter to fully complete the FAFSA. You will apply for an electronic pin so you can “sign” your FAFSA online. This is a random 4-digit number assigned to you; if you forget it, you have the option to request a reminder of it by email or to display it onscreen. Your log-in information will be your social security number, your last name, and your birth date. Within 3 to 5 days after you complete your FAFSA, you will receive your Student Aid Report (SAR) that provides you with an estimate of what your own financial contribution would be (known as the Expected Family Contribution or EFC). This EFC figure doesn’t mean you will actually pay that amount, but the figure helps the college financial aid department to determine what type of financial aid package to award you. That financial award will then be applied to your tuition expenses at the beginning of each semester. Grants provide a way to cover expenses and don’t require repayment, and are need-based. The most common grant for undergraduate students is the Federal Pell Grant. In addition to your financial need, other criteria to determine the amount of your grant are tuition costs, part-time or full-time student status, and whether or not you plan to complete a full academic year. Federal Supplemental Educational Opportunity Grants (FSEOG) are campus-based grants for undergraduate students who demonstrate “exceptional need” and are available on a first come, first served basis. Other grants are available from state governments, colleges and universities themselves, public and private organizations, and professional associations. Like grants, scholarships will not put you in debt for repayment, but instead of being need-based, they are merit-based. Scholarships are highly competitive and stipulate eligibility requirements and strict deadlines for application. FastWeb is a site that provides comprehensive information about available scholarships and after you input required information, provides a list of scholarship matches, along with their application deadlines. 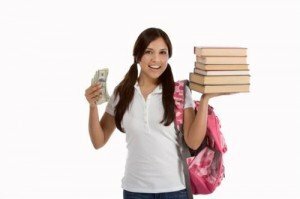 Now that you have learned about how to find financial aid to fund your education, you are probably excited to begin your educational journey. Here at Web College Search, we are happy to provide you with answers to your questions and valuable, helpful articles.